I will be at the the Ashland Farmers Market on Saturday, May 3, from 9am-noon with my books and DVDs. I was one of the founding farmers of the market in 1999 and it has been nice to see how much the market has grown over the years. It will be exciting to be back on opening day 15 years later. After growing food to sell locally for 10 years, I left the markets after the 2001 season to focus on teaching and on exploring sustainable food production from the garden all the way to the table. In the years since, my students have been customers, vendors, and market managers at the Ashland Market and at many more markets around the state. When I was selling at the Ashland Market, and even before that, people would often approach me with questions about organic growing. I began to teach out of self-defense. I was instrumental in developing the Sustainable Agriculture program at J. Sargeant Reynolds Community College in Goochland and taught there from 1999-2010. My daughter, Betsy Trice, teaches those courses now. 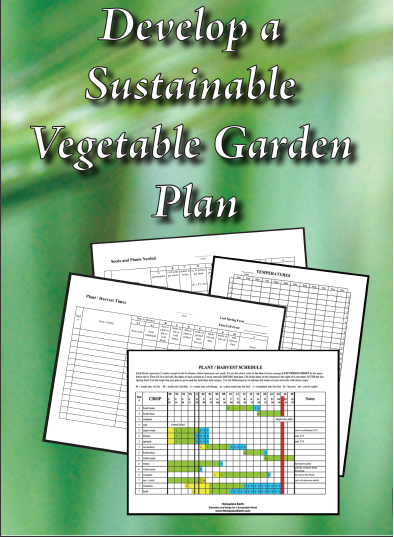 I developed the DVDs about garden planning and cover crops from what I was teaching. They are part of the curriculum at the college and are great for people to use as teaching tools for themselves or with groups. My book Grow a Sustainable Diet is also a teaching tool. When you read it I hope you feel like I was right there with you. Just as if you were in my class, there are worksheets to use and references to point you to more information on many topics. The Ashland Farmers Market is in Ashland, Virginia at 121 Thompson St, behind the Town Hall. See you there on Saturday! 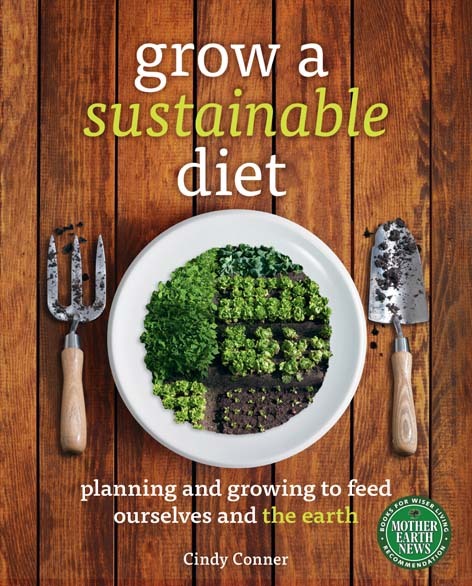 How Much to Grow is the title of Chapter 4 in Grow a Sustainable Diet. If your garden is small and whatever you get from it is a welcome addition to your table, you might not be concerned with exactly how many pounds are produced of anything. You are just happy to have homegrown food in your meals. If you want to be able to predict how much your harvest will be so you can plan to have a certain amount for your family to eat, you can put pencil to paper now and do some calculating. Chapter 4 contains a worksheet (you see part of it here) to help with those calculations. (There is a link in the book that will take you to PDFs of all the worksheets so you can print them out.) Whether you are trying to decide how much to grow for your family or for your CSA, the process is the same. Decide how much you want for each week and how many weeks you will be eating it, or in the case of a CSA, how many weeks you need to put it in the CSA boxes. If you have no idea how many pounds of something you need, go to the grocery store and pick out a reasonable quantity for a meal in the produce department. Weigh it on the scale that is right there. Multiply that weight by how many meals per week that item will supply and you have the pounds needed per week. The number of weeks you want to eat something could be only the weeks it is fresh from the garden, or every week of the year if you are preserving for eating out of season. Rather than the weight, you may need to know the count; how many of something you will have, such as butternut squash. Sometimes you can find that information in the seed catalogs, and sometimes not. From my experience, I know that I can expect about 4 squash per plant. If the catalog doesn’t have that information for the variety you choose, read the description of all the varieties, as well as the specifics for each crop to get an estimate. Finding out how much is needed is the easy part. You need to know how much you can grow in your area and pounds/100 ft² is a good universal measure to use. How to Grow More Vegetables by John Jeavons has Master Charts that can help you with that. The Master Charts have columns for Biointensive yields and for the US Average for each crop. Use those figures as guidelines. Your yield will depend on many factors, including your soil, climate, and management style. You might already know how much you can harvest in the area planted. If not, this exercise should encourage you to record your harvests this year, at least for the crops you are most interested in. Remember the charts are only guidelines. For the Biointensive yield, the Master Charts give three numbers; the beginning yield that you could expect getting at some time, the intermediate yield that could be reached after good soil building, and a high yield that few might reach. 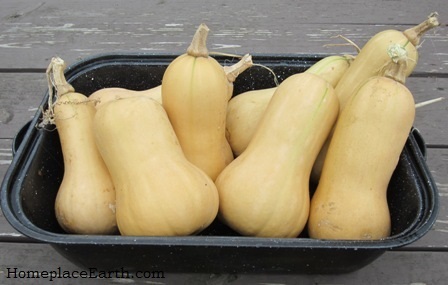 The Biointensive yield of winter squash is shown as 50/100/350. There is no US Average shown in the Master Charts, but my research determines that number to be 49.5 pounds/100 ft². The target yield I use for butternut squash is 150 pounds/100 ft². I have reached that yield and sometimes higher in my garden. For cowpeas, the Biointensive yield is 2.4/4/5.9. 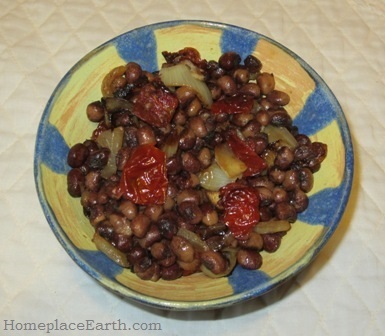 The US Yield of cowpeas isn’t shown, but through my research I’ve determined it to be 2.6 pounds. 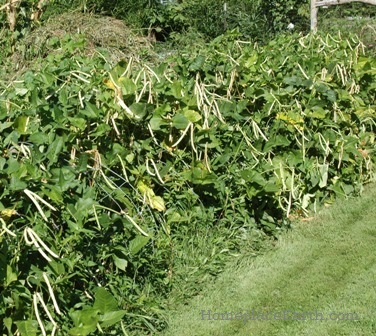 I live in a great climate for cowpeas and have found I can use 5 pounds/100 ft² as my target yield. On the other hand, I would love to plan on getting 100 pounds/100 ft² regularly with my potatoes, but the voles keep the yield below that. The Biointensive yield for potatoes is 100/200/780 and the US Average is 84.2. Depending on the variety, I don’t always reach the low Biointensive yield of 100 pounds for tomatoes. The US Average for tomatoes is 67 pounds for fresh and 153.4 pounds for processing tomatoes per 100 ft². From your garden map you will know how much space you have available. My post Making a Garden Map can help you with that. It becomes a balancing act, deciding how much space to allot for each crop. Having a target yield makes planning easier. Your target yield may need to be adjusted from year to year, but at least you have someplace to start from. Between cover crops and food crops, plan to have your beds full all year. 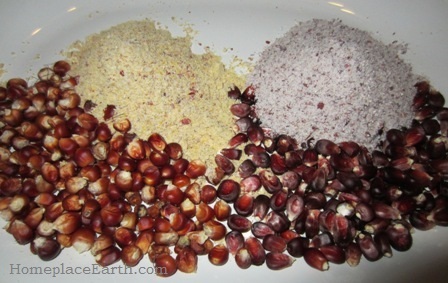 Immediately after your early spring crops are harvested, plant the next crop. Leaving the beds empty is an invitation for Mother Nature to plant her favorites, which we tend to think of as weeds. The rest of the page of the How Much to Grow worksheet that you don’t see is a space for comments and three columns for the amount of calories, protein, and calcium per pound of food. It is always good to leave space for comments—something about that crop you want to remember. Since I keep records for my certification as a GROW BIOINTENSIVE Sustainable Minifarming teacher, I am interested in the amount of calories, protein, and calcium in each crop. There might be other things that you want to record in those additional columns. Use this information to enhance what you are doing, but don’t let it overwhelm you. Keep track of what you can. As you find you have more questions, add the appropriate recordkeeping to your system. Most importantly—have fun in your garden this year! March 16, 2014 Lynchburg College, Lynchburg VA. Feeding Ourselves Sustainably Year Round. Cindy will be joining Ira Wallace, author of Vegetable Gardening in the Southeast, and Pam Dawling, author of Sustainable Market Farming, for a program from 10am-3pm in Hopwood Auditorium. Free admission. Seating is limited. Email yos@lynchburg.edu to reserve your seat. Books and DVDs available for sale. April 9, 2014 Summers County Public Library, Hinton, WV. Cindy will be giving the presentation Grow a Sustainable Diet and signing her new book. 3pm. www.summers.lib.wv.us. 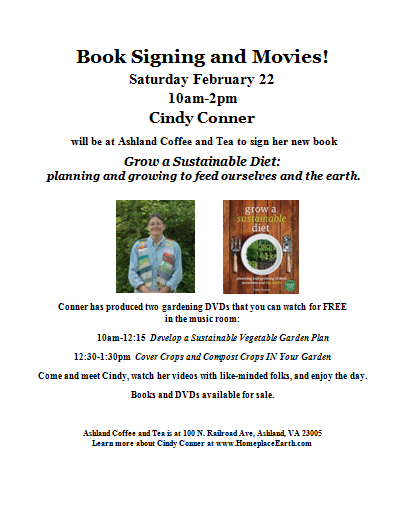 April 10, 2014 Washington County Public Library, Abingdon, VA. Cindy will be giving the presentation Grow a Sustainable Diet and signing her new book. 6pm. www.wcpl.net. April 12-13, 2014 Mother Earth News Fair, Asheville, NC. Look for Cindy on the speaker schedule. www.motherearthnewsfair.com. Come out and see me at my book signing on Saturday, February 22 at Ashland Coffee and Tea, Ashland, VA 23005. It is a good treatment for the spring fever you will have by the weekend with the warming trend coming. Find more upcoming events at http://homeplaceearth.com/5.html. Growing up Catholic I was familiar with the term Feast Day. It was a day when certain saints were remembered. Unfortunately, I don’t remember any food feast on those days and the only celebration would have been attending Mass. I assume other cultures somewhere celebrated with a food feast at some point, and maybe still do. St. Patrick’s Day receives a lot of attention. We have feast days within our family when we celebrate birthdays. Weddings, especially, are feast days and the happy couple celebrates that day from then on. We need to declare other events in our lives as feast days, if only for one day, and pay particular attention to the feast involved. I’m sure you can find many things to celebrate, so I’ll concentrate on the food part in this post. This photo is one I took when I was writing my Homegrown Fridays post in 2011. 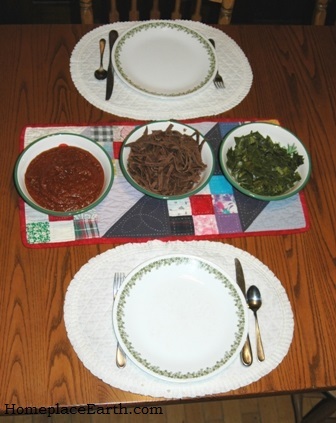 Our dinner that evening was sorghum noodles, tomato sauce, and steamed collards—all food from our garden. Every bite we take is a vote for how we want the earth used to grow our food. If we really take that thought to heart we become mindful of what we are eating and where it is grown. To be healthy beings, our food needs to be grown in healthy soil. 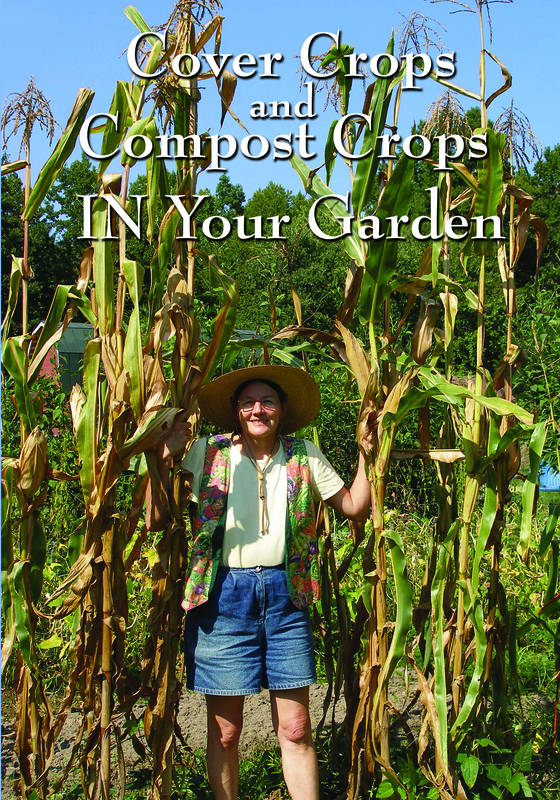 My other posts, my DVDs, and my book will help you plan your garden to feed the soil, while growing to feed yourself. Most likely, you are not growing all your food. That brings the opportunity to find growers who pay particular attention to the soil to provide you with good food. Farmers markets have sprouted everywhere and many have times when they are open during the winter months, allowing you to source your food directly from the growers. That way you can inquire about their practices. Grocery stores, even big ones, are carrying more local food. Foodhubs have been established for small growers to pool their produce to sell to the large buyers. In the big scheme of things, it is not practical for a large store to deal with many, many small-scale growers. Also, there are small-scale growers who don’t want to sit at the farmers markets waiting for you to come by. For them, the foodhub is a welcome place to sell what they grow, as are restaurants. Eat at restaurants that buy from local, sustainable growers. You can find sources of local food at www.localharvest.org. Find out what you can about each grower you buy from. Just because they are local doesn’t necessarily mean they are organic or sustainable. We are often involved in potluck dinners. That’s the way to go with a large group of people. Hopefully everyone brings a large dish of food to share so there is enough food for however many people show up. When I was the faculty advisor for the Sustainable Agriculture Club at the community college we came up with the idea of a sustainable potluck, since we didn’t want to have to buy or throw away paper and plastic products. In a sustainable potluck, everyone brings their own non-disposable table service—plate, cup, and silverware. We loved it! 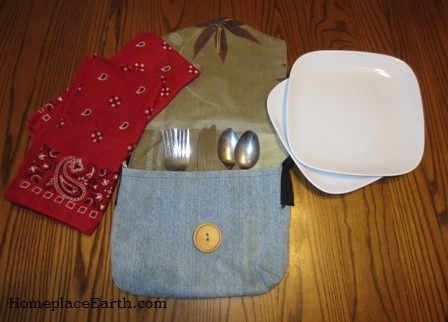 To make that experience even more enjoyable, one year our daughter Betsy gave me a birthday gift of a travel kit with plates, silverware, and napkins (red work handkerchiefs). Her old bluejeans provided some of the fabric. This kit is so handy. When my husband and I travel we even take it to the hotels that only offer Styrofoam plates for the free breakfast. The sustainable potluck idea worked so well I suggested it to my beekeeping club. It took a few times for some folks to get used to the idea, but now it works like a charm. There is no trash! I didn’t have to mention it at the handspinning group I joined. They were already bringing their own table service to their potlucks. I belong to one other organization that has a potluck twice a year. When they start to make plans I bring up the idea of bringing our own table service, along with our potluck dishes. Each time the response is a flat-out no, with no discussion. I know that others in the room agree with my idea, but they never speak up. It is painful for me to see the trash accumulate at these events, so I choose not to attend. When new ideas are suggested, if you agree you have to speak up. That is the only way to bring about change. Every action we take is important—whether it is the food we eat or how we eat it. Where will all that trash go if we choose to generate it? Our county landfill is full and the trash is now shipped elsewhere. Our celebrations should not be responsible for trashing someone else’s backyard. Planning a zero waste event can be a fun challenge. You can learn more about how to do that and feed a crowd at my Homegrown Wedding post. Each day, each meal can become a feast when we contemplate what we are eating and how it is grown. The closer we are to the source, the more sacred our food and the act of eating it becomes. In naming feast days and preparing the food, we have to remember to be thankful that we have something to celebrate and thankful for the food that will be shared. An attitude of gratitude puts us in a position for well-being in so many ways. We all know people who pick out the bad in everything. We need to look for the good. Everything is important and everything has something positive. Find the good and celebrate with food from your garden or local sustainable sources. Grow a Sustainable Diet now available! My new book Grow a Sustainable Diet: planning and growing to feed ourselves and the earth is now available through my website at HomeplaceEarth.com. The home page contains two recently added preview videos about our DVDs. The purchase page contains more information about the book, plus the “add to cart” button to buy it. 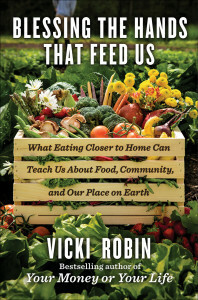 You’ll find more information about what this book is about at my August 13, 2013 post Grow a Sustainable Diet–the Book!